click image for close-up During the Renaissance and for many years before, occasional African slaves were imported into Europe through trade with Arabs. The German artist Albrecht Dürer used one of these slaves for the subject of this charcoal drawing. 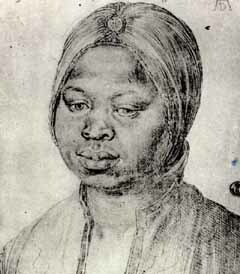 The term "Moorish Woman" in the title suggests that the woman was from the northwest region of Africa and of the Muslim faith. This beautiful charcoal likeness, used in the broadcast program and by this Web site to represent Mary Johnson, was sketched about a century before her birth. Any resemblance between Katharina, the person in this image, and Mary Johnson would be purely coincidental.